Hana Waterfall Hike is a full-day excursion. You completely circle the east side of Maui on the way to and from the day’s premier hiking stop at Oheo Gulch. Although this area is known as “The Seven Sacred Pools,” you will discover more than just 7 pools! 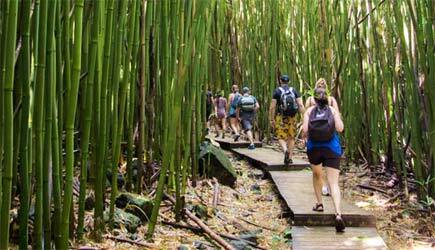 Trek through bamboo forests with views of smaller waterfalls, and a 200 foot waterfall. Then arrive at the spectacular valley near the bottom of 400 foot Waimoku Falls! On the scenic “Road To Hana”, you will also experience a variety of ocean overlooks and waterfalls. This long epic day will be one for the books! Check In: This tour includes complimentary pickup at most Maui hotels. For those staying outside of the pickup area, meet your guide at the Park-n-Ride lot in Kahului (near the intersection of Highway 350 & Highway 380). Restrictions: Minimum age for this tour is 8. What to Bring & Wear: Running shoes or sports sandals that can get wet and muddy. Shorts and short-sleeved shirts or t-shirts. If mosquitoes really bother you (your guide carries repellent), you could wear long pants and a long-sleeved shirt. Wear a swimsuit underneath so you can swim in the waterfall pools. Bring a towel and sunscreen and your camera & phone in a Ziploc or waterproof bag. Cash to tip the guide. 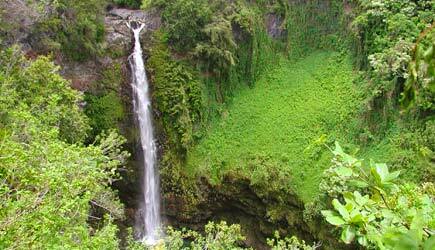 Hana Waterfall Hike is not available for cruise ship passengers because of its long day itinerary. The answer to that question is a definitive “no”. You could walk down the same trail on your own and your experience would be completely different. The presence of a knowledgeable local guide who loves the “aina” (land) can make all the difference in your understanding and appreciation of everything that you see and do. You’ll learn about plants that have multiple uses (medicinal and practical) that you never imagined. You’ll taste delicious local fruits and be warned off of poisonous ones. You’ll learn about the history, geology and Hawaiian folklore of the area that offers insight you wouldn’t get going there alone. Hike Maui, the company that organizes these tours, likes to refer to their guides as “the secret ingredient for your experience”. A guide also knows exactly where these special places are – so your day in the magical rainforest or volcanic landscape is maximized. No hunting for that elusive waterfall … you’ll go straight there and have more time to frolic in the tropic pools. A guide who knows the “aina” will help keep you safe and provide support if you need it. Would you like to jump off a cliff into a waterfall pool below? Doesn’t it sound like a good idea to have a guide who can tell you where it is safe to jump and where there a rocks hiding below the surface? If you are really into hiking, you might consider doing two of these tours … either the Hana Waterfall Hike or the East Maui Waterfall Hike on one day paired with the Haleakala Crater Hike on another. If you want to do a quick one, check out the Short Waterfall Walk. A word about gratuities … it is traditional for guides in a service industry to rely on gratuities for a significant portion of their income. This time-honored tradition promotes excellence in service and you might want to bring along cash in case you want to express your appreciation to your guide in this way. Please note that for larger parties of 7-10 people this tour operator asks us to include a $150 gratuity for guides in our billing for your tour.